It is not often that the editors and authors of a research volume in entrepreneurship have the opportunity to revisit their work and discuss the “state of the art” since their respective chapters were written. However, we have been given that opportunity with this “revisiting” volume. A number of the authors of our first Mind book, along with some new colleagues, take a second look at the research, theories, and approaches now being employed in the study of the entrepreneurial cognitions and motivations. 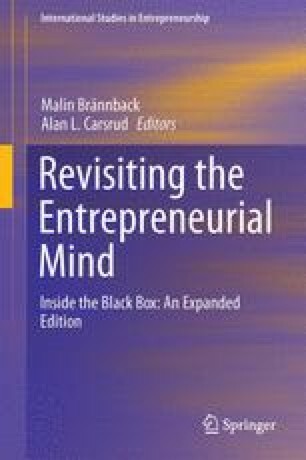 This volume Revisiting the Entrepreneurial Mind: Inside the Black Box builds upon (and includes) many of the chapters originally found in our Understanding the Entrepreneurial Mind: Opening the Black Box (Carsrud and Brännback 2009).